Amsale bridesmaid gowns are really popular amongst our brides. We love the huge range of shapes that they have available as well as their unmatched ability to listen to client feedback. Each season they add more thoughtful and effective designs to their range, whether it be bra friendly styles or chic maternity options. They really listen. Whilst looking through the ranges and looking forward to the new year trends we couldn’t help but also notice they have nailed the pink palette. We expect this colour to be big again this year and so thought we’d highlight how well Amsale does this timeless wedding colour. One of the first things that a bride selects when planning her wedding are her wedding colours. The bridesmaid gowns are a huge part of this colour scheme so it’s not a decision to make lightly. We are expecting pink to be a huge colour for brides this year and whether you’re going pale pink, pastel or bold Amsale has the hue for you. The Amsale pink range includes Peony, Blush, Ballet, Bellini, Fawn and Rose across their fabric ranges. 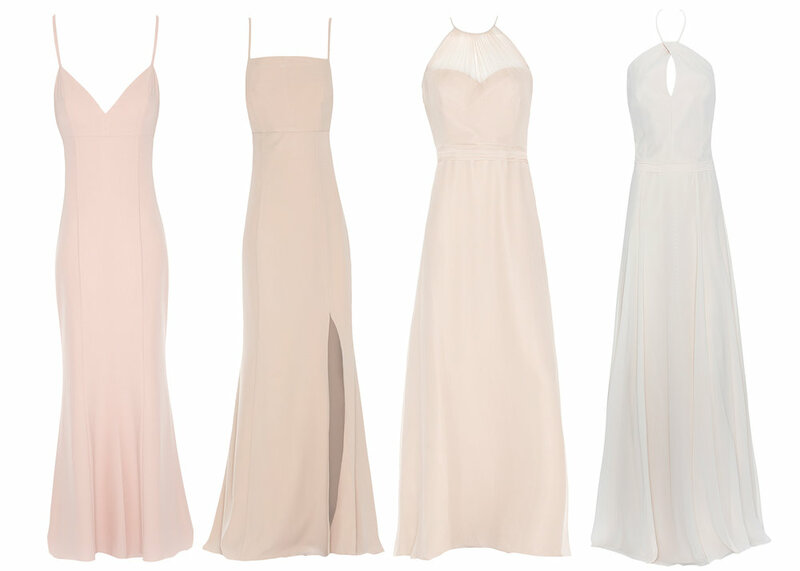 They have Faille, Silk chiffon, Flat chiffon, Crepe and Tulle gowns so the options are endless. Each a beautiful tone but giving you the freedom to choose based upon skin tones or flower choices. We especially love it when brides choose to mix n match their bridesmaid gowns with different tones and fabrics. See some examples below. If you like reading about Amsale gowns click HERE to continue reading.